Young and old come together to remember. Remembrance. We were joined by members of the Sir Richard Arkwright Masson Mill Band who provided the music. The Chair of the Parish Council in his introduction said “It is so encouraging to see so many young people gathered at this important community event especially as some are contributing with readings” The readings, taken from work done for the Heritage Lottery supported WW1 project ‘The Great War – Life in The Bath’ included dedications to two of the fallen, writings from a postcard sent from Matlock Bath to the front and creative writing done by pupils from Matlock Bath Holy Trinity School. There was also a reading of an account researched on a truce in the conflict at Gallipoli. After the reading of the names of the fallen, wreaths were placed on behalf of the Parish Council and the children of the village and the last post was sounded. 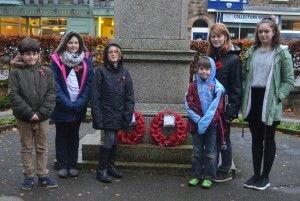 Pictured by the memorial are the young people who from the village who contributed to this year’s Remembrance. From left to right: Noah Whitehead, Hannah West, Gaby Wolfenden, Peter McCrea, Shelby Hirstwood and Ellen Hollands.